Some books take work to finish. Take, for instance, Cryptonomicon, the 1999 novel by Neal Stephenson. In paperback, it’s 1,168 pages, and while it contains scenes that flow freely, the separation between the three main characters in two time periods calls for some serious concentration. Add to that the healthy doses of mathematics and computer programming talk and you’ve got a chunk of a story to swallow. I’m 34 percent through with the book according to Kindle, and while I have no desire to give up, I know that this satisfying read is working out my brain muscles like crazy. Similarly, there are beers that take work to finish. This would seem like a slam on them, and sometimes it is. But really, unless you paid $150 for a 24-ounce bottle, most would simply pass a beer that takes work off onto someone else or drain-pour it instead of suffer through. Two Roads Brewing of Stratford, Conn., makes a beer that I find work to get through, but I should stress that this is not a damnation. 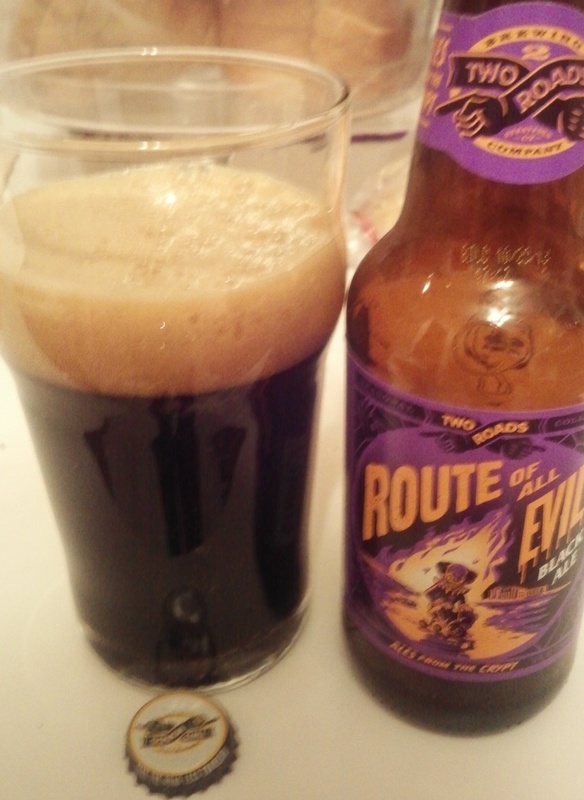 Route of All Evil is a “black ale,” that at 7.5 percent alcohol by volume packs a bit of woozy. It’s a dark brown, almost black, and smells a bit like plum. Since “black ale” isn’t specific enough for me, I made peace with calling this a porter, although the harshest porter I’ve had (which I guess keeps it out of that category). The piney hops are aggressive and prickly, which kept me from chugging. But even little sips made the bitter-chocolate taste a bit of a wrestle. As it warmed up, the malt came through a bit more. I tried it with a Hershey’s kiss, but that only made the bitterness more pronounced. My mouth got used to the beer eventually, and I felt as if I’d made it to a plateau and could enjoy the view so many were talking about. I learned not to give up on Two Roads’ beer, but I’ll admit I couldn’t finish the 12 ounces. I may do the same with Crytonomicon, but that doesn’t mean I didn’t enjoy the plot along the way. This entry was posted in Beer reviews and tagged Two Roads Brewing. Bookmark the permalink.